Mar. 1980 B. S., Kyoto Institute of Technology. Feb. 1989 Daihatsu Motor Co., Ltd (Daihatsu). Jul. 1998 Ph. D., The University of Tokyo. Apr. 2004 Principal Scientist, Materials R&D Division, Daihatsu Motor Co., Ltd.
Mar. 1993 B. S., Kyoto Institute of Technology. Apr. 1993 Research Engineer, Materials Research & Development department,Daihatsu Motor Co., Ltd.
Mar. 1985 M. S., Kwansei Gakuin University. Jul. 1989 Ph. D., Kwansei Gakuin University. Apr. 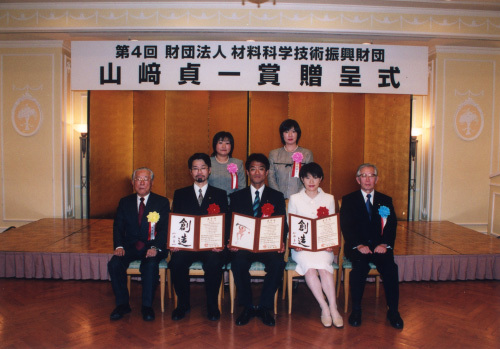 1997 Research Scientist, Kansai Research Establishment, Japan Atomic Energy Research Institute (JAERI Kansai). Apr. 2004 Deputy Group Leader, Structural Physics Research Group,JAERI Kansai. The hazardous components in the exhaust from cars fueled by gasoline include hydrocarbons, carbon monoxide, and nitrogen oxides. Automotive catalysts oxidize hydrocarbons and carbon monoxide, turning them into safe water and carbon dioxide while simultaneously reducing nitrogen oxides into nitrogen . Automotive catalysts were widely used from the 1970s, when practical application began, but since the 1990s, the fact that restrictions on automobile exhaust have become stricter throughout the world has necessitated exhaust purification immediately after engine startup. In keeping, catalysts with high heat resistance that could be installed just beneath the engine were sought. Three types of precious metals are used in automotive catalysts: platinum, palladium and rhodium. Although palladium is the best of them in terms of hydrocarbon oxidation activity, its melting point is low and it easily deteriorates, making large quantities of it necessary. Thus, in the past ten years, usage quantity has grown tenfold, leading to a strong call for major reductions in usage. For many years, both Hirohisa Tanaka and Mari Uenishi have been involved in automotive catalyst development at Daihatsu Motor Co., Ltd., which led to their success in developing a world-leading catalyst in which palladium self-regenerates to purify exhaust. Yasuo Nishihata is affiliated with Japan Atomic Energy Research Institute and, through use of SPring-8, contributed substantially to elucidating the self-regenerative mechanism of the new exhaust-purifying catalyst that was developed. Named as an intelligent catalyst, this exhaust-purifying catalyst features a mechanism that is vastly different from that of the conventional catalysts. Conventional automotive catalysts are structured to disperse three types of precious metals on the surface of ceramic particles of large surface area, such as alumina or ceria-zirconia composite, with which they coat the monolithic support, so called honeycomb. With this structure, precious-metal particles move and aggregate at high temperatures, resulting in particle growth. They also enlarge to a size of 120 nanometers, which both reduces the activity necessary for exhaust purification and causes deterioration. With the intelligent catalyst, palladium exists in the lattice of perovskite-type crystal structure it has penetrated to purify exhaust. The size of the intelligent catalyst's palladium particles deposited through the natural redox fluctuations of exhaust is 1-3 nanometers -- extremely small compared to the enlarged palladium particles mentioned earlier. These particles then re-solidify in the ceramic crystals through the process of self-regeneration. Although this self-regeneration cycle maintains satisfactory durability to ensure that there are no problems in actual application, it was confirmed in testing on full-scale cars, and the Daihatsu Move was first equipped with the catalyst in 2002. At present, 47,000 cars a month are manufactured with it. It was verified that this intelligent catalyst is able to reduce toxic substances 75% below the level for 2005 exhaust restrictions (qualifying it for SULEV), and compact cars, as well, equipped with it have been selling since the beginning of 2004. The self-regenerative mechanism of the intelligent catalyst was published in the July 2002 edition of science magazine Nature. In addition, five major patents have been acquired in connection with the new catalyst. This technology demonstrates catalyst performance equal or superior to that of the conventional catalysts, even with a 70% reduction in the amount of precious metals used. Thus, it can contribute to substantial reduction of precious metal consumption and to stable supply. Moreover, this catalyst also demonstrates high performance and long service life when applied to the pharmaceutical synthesis process; thus, its use is expected to be manifold. Demand for precious metals for use in automotive catalysts is rapidly increasing owing to increasingly stringent exhaust restrictions worldwide. In particular, the demand for palladium, which excels in low-temperature exhaust purification, has increased tenfold in the past ten years. This has had a major impact on demand in other areas, as well, giving rise to a social mission to substantially reduce the quantity of palladium used. To resolve this issue, an exhaust-purifying catalyst was developed using the world's first self-regenerative precious metal and has been practically applied to maintain purifying performance with a minimum amount of precious metal. The intelligent catalyst is based on a completely new concept. Arrangement of palladium ions inside crystals of perovskite oxide with an ABO3 atomic structure provides active self-regenerative function within automotive exhaust, without necessitating special engine control or the like (Fig. 1). When precious metals, which serve as the active site, are in use, the conventional catalysts become enlarged on ceramic surfaces, causing activity to continue to deteriorate. To compensate, large quantities of precious metals are needed (Fig. 2). Conventionally, catalysts induce surface reactions and were thought to impair activity even when dispersed inside coating layers that made it difficult for precious metals to be in contact with exhaust. It was also thought that arranging precious metals in crystals as composite oxides would detract from their activity, wasting the precious metals themselves. With intelligent catalysts, precious metals solidified inside crystals use the natural redox (oxidation-reduction) atmospheric fluctuations of exhaust. Through repeated deposition and solidification, the minuteness of the precious metals is preserved and outstanding performance, in terms of automotive service life, maintained. This self-regenerative mechanism was elucidated through research utilizing SPring-8; announced in the July 11, 2002 edition of science magazine Nature, it has attracted the attention of various countries. For practical application, an intelligent catalyst was developed with a new composition (LaFePdO3) that excluded cobalt, owing to environmental considerations. Peripheral technology to effectively utilize the self-regenerative function was also developed and incorporated in catalyst design. The catalyst for practical application has been used in the new light cars launched in October 2002. Certification under the ultra low emission vehicle (ULEV☆☆☆) standard was obtained, as has certification under the super ultra low emission vehicle (SULEV☆☆☆☆) standard enacted in January 2004. With the catalyst having swiftly met Japan's strictest exhaust standards, over 700,000 vehicles are already equipped with it. Even though the amount of precious metals used has been reduced 70-90%, activity equal or superior to that of the conventional catalysts can be maintained. Tanaka initiated catalyst development work at Daihatsu Motor Co., Ltd. and through 14 years of elaborate research, had a consistently central role in discovering the self-regenerative phenomenon, proposing its concept and succeeding with its practical implementation. Uenishi was in charge of practical business at every stage -- from the material development of the initial stage to catalyst design of the final stage -- and elicited the performance on which the concept centered. Utilizing SPring-8, Nishihata elucidated the self-regenerative mechanism from the crystal structure of catalyst specimens and the electronic state of precious metals. This catalyst technology is universal in that it arranges precious metals, as ions, within ceramic crystals and uses the natural atmospheric fluctuations in exhaust for solidification and deposition. It is expected to serve as the international standard for catalyst design henceforth. This technology can greatly reduce catalyst cost and contribute to the stability of precious-metals demand for automotive purposes. In addition, this intelligent catalyst features high performance and long service life also for the pharmaceutical synthesis process and the like; thus, its application to other industries is also anticipated.